I made several color options of the Rustic Botanicals background while the stamps were on my MISTI last week. And I was gifted a few new inks on my birthday (thanks Offspring3 & Offspring1!! 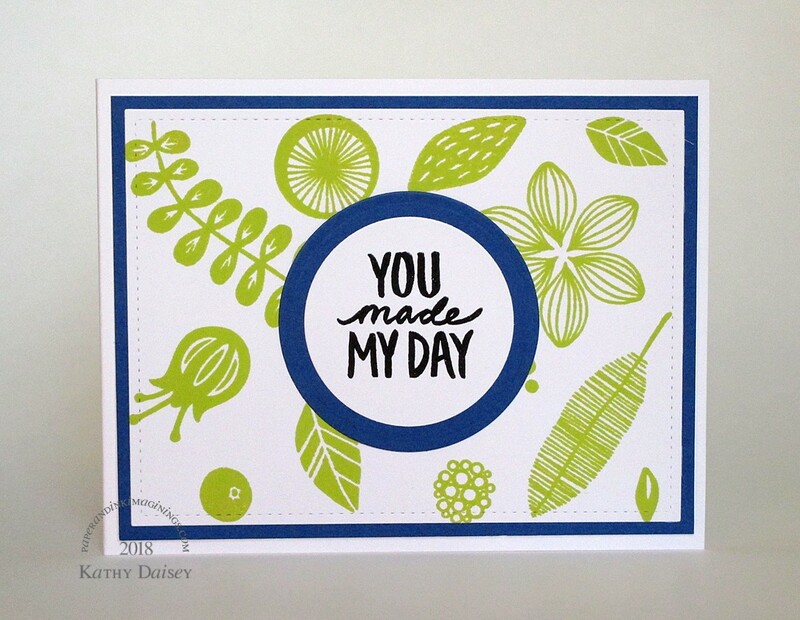 ), this one is Gina K. Designs Key Lime. LOVE IT. I am trying to decide which brands of ink pads I like – my Stampin’ Up! pads have seen better days (and I don’t like their coverage with clear stamps). I am loving the Gina K. and the Lawn Fawn pads. I also have a few Simon Says Stamp pads, I have to pull them out and do a sample sheet that matches the sample sheet I did for the most recent ones so I am comparing apples to apples. I am delivering cards to HorseSpirit Arts Gallery at Historic Savage Mill today! The grand opening is Saturday, November 10, 2018 at 10:00am. There will be a reception from 5:00 – 9:00pm that evening. Supplies: Stamps – Essentials by Ellen, Stampin’ Up!, paper – Gmund Royal, Neenah Classic Crest Solar White, inks – Gina K. Designs Key Lime, VersaFine Onyx Black, dies – Lawn Fawn (stitched rectangle), Spellbinders (circles), embossing powder – Stampendous Detail clear. Categories: card, caring, encouragement | Tags: card, Essentials by Ellen, Gina K. Designs, Gmund, Lawn Fawn, Neenah, Spellbinders, Stampendous, Stampin' Up!, Tsukineko, VersaFine | Permalink. Again, nice work, a belated Happy Birthday and thanks for the heads up about Horse Spirits in Savage Mill. I can’t make it the 10th but will be down there soon to pick up a card or two of yours. Thanks for the birthday wishes, Mike! The Gallery is looking so good!